The Urban Grocery Delivery System (UGDS) for farms and small markets provides an end to end system to get your products to your customers through either delivery, pickup or both. The system provides a complete shopping cart, order fulfillment, invoicing and web design system for a low monthly fee. The UGDS is provided on a SAAS (software as a service) platform; you can access the UGDS anywhere, anytime on any internet connected device (We recommend a minimum device size of 11 inch screen with a keyboard, such as Chromebook). The UGDS supports online as well as telephone ordering. or request a demo site log in online. Add up to 1000 products and pictures from any internet connected device. Online orders can be immediately fulfilled from any internet connected device, or pick lists can be printed out. Invoices can be generated immediately for emailing or can be printed out. Entering telephone orders is supported. The Urban Grocery Delivery System supports multiple delivery rates and easy markup of products overall, by section, by category using percentage or fixed markups. You can also markup items individually. Customers can log in to your shopping cart and order from a list of their previously ordered items . Use up to seven different coupon codes to give promotional discounts by percent or a fixed amount. Track customer contacts and sales data. Create and email or print customized follow up letters for customers. Use the included content management system to create and manage your information pages. Google Analytics support is included. Includes your complete website and shopping cart for just $29 per month plus $0.20 per online order. Why settle for a blank order form with no shopping cart from some other company when you can get a complete shopping cart, order fulfillment and invoicing system from Urban Grocery for just $29 per month plus $.20 per online order? We support the UGDS with free telephone and email support. Click here to see the UGDS Shopping Cart. 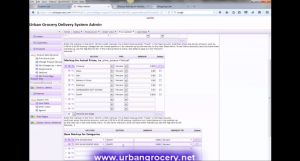 Call now to access the Urban Grocery Delivery System Demo Site Plus a tour of the system: 202-544-5081. Need help setting up your grocery delivery business? Urban Grocery provides consulting and set up services. One month of the Urban Grocery Delivery System service paid annually: $24.92. One month of the Urban Grocery Delivery System service: $29. Set up (one time) $49. $0.20 per online order received. One hour of live online web training is included. Please email us if you have questions or need more information, or call 202-544-5081.